Almost a month ago I promised Ellen, the Rec Director for the nursing home where I volunteer, that I’d deliver twenty flower pins this week as an early Mother’s Day gift for the ladies who take part in Rec Activities. After a closer look at three rose pattern candidates, I decided to go with Travel Blooms (minus the loop) and got to work. 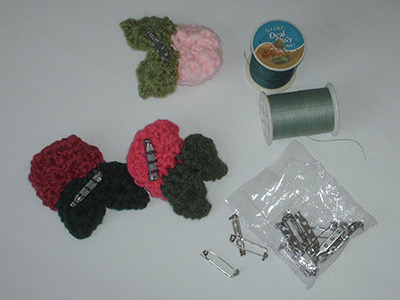 but sewing the three parts together and adding the pin was quite fussy and time-consuming. 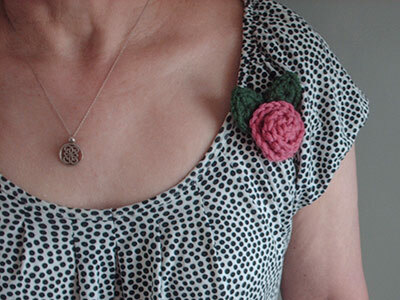 Of course, the five extra rose pins that I crocheted for myself, the two receptionists, the crocheting aide, and the gift shop volunteer, why those didn’t take any time at all! lol. Now, I know that I could have saved alotta time by hot gluing the pins on, but sewing looks so much better and, I think, will be more durable. and then we helped each other pin them on. Here’s mine. Because of privacy issues I can’t share photos of the ladies’ happy faces, but suffice it to say that right then. . . 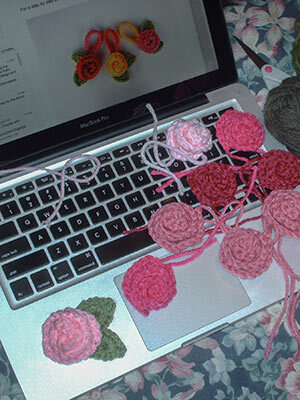 I was not thinking about how much time it took to sew those roses together! Rose colors that I recognize: Red Heart Super Saver ‘Shocking Pink’ from Sandi of MD and RHSS ‘Petal Pink’. The lightest green leaves are RHSS ‘Tea Leaf’. 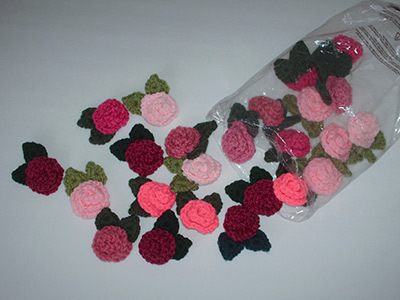 This entry was posted in Crochet Corner and tagged crocheted roses, Travel Blooms. Bookmark the permalink.